Harlequin Presents brings you four new titles for one great price! Enjoy glamorous international settings, powerful men and scandalous, seductive romance in these four books! 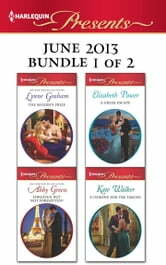 This Harlequin Presents bundles includes The Sheikh’s Prize by Lynne Graham, Forgiven But Not Forgotten? by Abby Green, A Greek Escape by Elizabeth Power and A Throne for the Taking by Kate Walker.